Muscle Relief Bath Salts are crafted from a blend of soothing essential oils in sea salt. 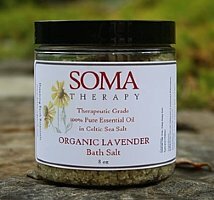 These fabulous Muscle Relief Aromatherapy Bath Salts are made with Coarse Grain Celtic Sea Salt (imported from France), our exquisite SomaTherapy Muscle Relief Blend of pure essential oils, and dried flower petals. Use these bath salts in a relaxing bath or foot soak. In traditional herbalism, the oils of this aromatherapy bath salts blend were used to ease muscle pain and promote the elimination of toxins. Especially good for those times when you've had a long day and feel the need to relax those aching muscles. The pure essential oils of this blend (Roman Chamomile, Cajeput, Ginger, Juniper, Lavender Provence, Marjoram, and Rosemary) ease muscle pain and promote the elimination of toxins. The bath salts actually drain the aches from your muscles, while the soothing scents fill you with a sense of calm and well-being. Review: This bath salt works great, especially after an afternoon of working in the yard. It eases your sore muscles and the aromas help to calm and relax your soul after a strenuous day of hard work. I highly recommend this product.